Air Niugini’s flight PX 275 was disrupted in Kavieng, New Ireland yesterday due to technical issue with the Automatic Pilot System. The aircraft was grounded in Kavieng while an engineer was positioned to recover the aircraft. After all work was done, clearance given and as the aircraft taxied to depart, the Auto Pilot defect re occurred hence the aircraft returned to the gate in Kavieng. 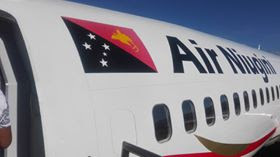 Some passengers from this flight were uplifted by a scheduled flight this morning out of Kavieng, especially those who were connecting flights out of Port Moresby today whilst the rest of the passengers were re-booked to depart Kavieng at 5:55am tomorrow. Radio Altimeter Sensors are now being sent to Kavieng this afternoon to correct the Auto Pilot and Ground Sensing system fault. Extensive System Tests will also be carried out to confirm correct functionality before the aircraft returns to service. Air Niugini regrets the inconvenience caused. Safety is always of paramount importance in their operations.